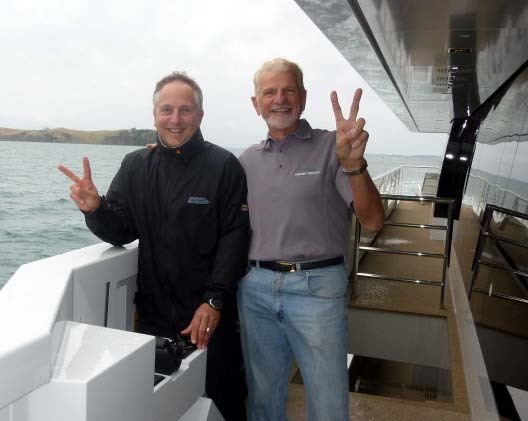 I had the pleasure to be invited to the launching party in Auckland New Zealand for the new 45m Explorer / expedition Yacht "Big Fish" designed by Greg Marshall. 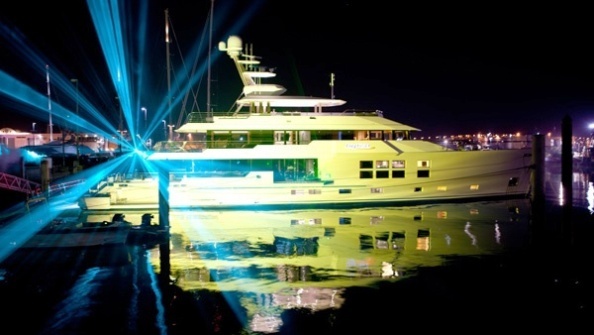 The vessel was built by "McMullen and Wing" in conjunction with "Aquos Yachts". 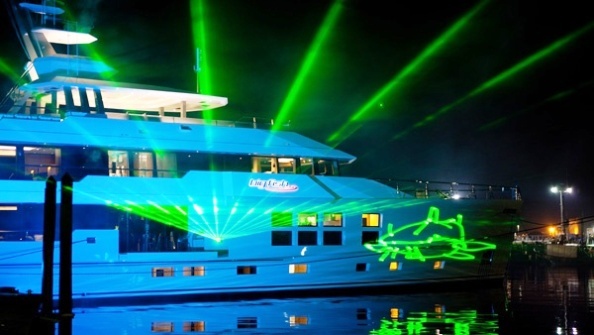 The two days of parties was extremely well done as was the yacht itself. Above and below are two photos from the 25 minute laser light show that they did. 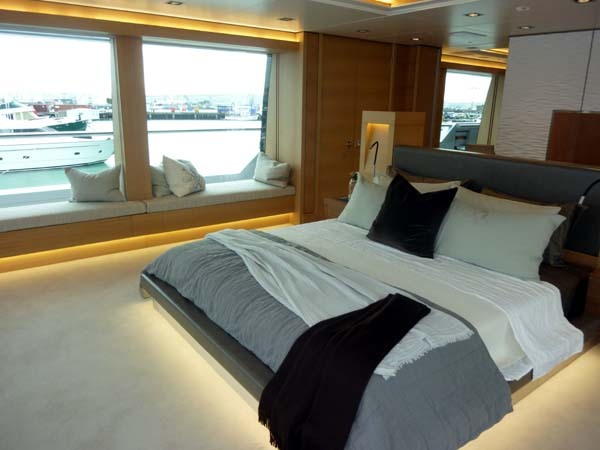 As innovating as the light show was it pales in comparison to the features found on the vessel. The build team did an incredible job of bringing this cutting edge vessel to reality. I had the pleasure to go out on a 3 hour sea trial on her and can tell you she has a wonderfully solid feel. Captain Winston, who did a superb job of bringing the vessel through the first set of operational trials, and I both agree she is a lady. She handles in a very balanced and predictable manor and is quite easy to maneuver. 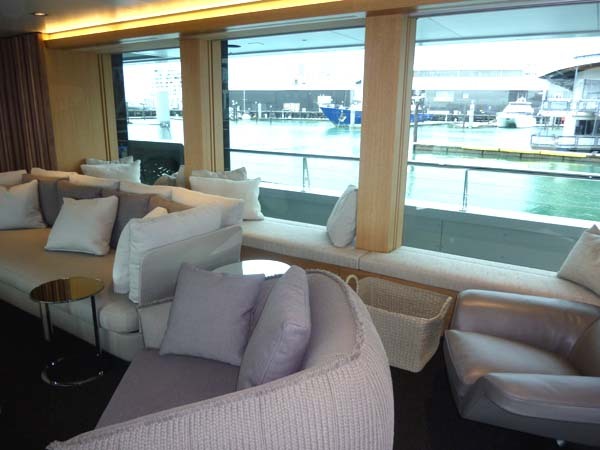 One of the many green and new features on the vessel is the first ever granite stone decking system. It works extremely well. I arrived several days before the party and as an old friend of David Darwent, the project manager who helped create the project and ran the build I was allowed onboard a few days before when things were being finished up. This always calls for lot of workers walking on and off the boat and working on all areas of the decks. On most boats there would be cardboard and door skin laid down over the decks and the crew would be in constant motion making sure the teak underneath did not get damaged. In this case the stone decks were exposed the whole time and the big clean up on them before the party consisted of a very hard down pour the day before the event. That's it, end of story. This allowed the crew to concentrate on other items throughout the vessel. The stone makes a great working surface, it is easy on the feet, the non skid very pleasing to the eye. I thought the weight factor would be a big problem with this material but is has the same square foot weight as 19mm teak and an indefinite life cycle. 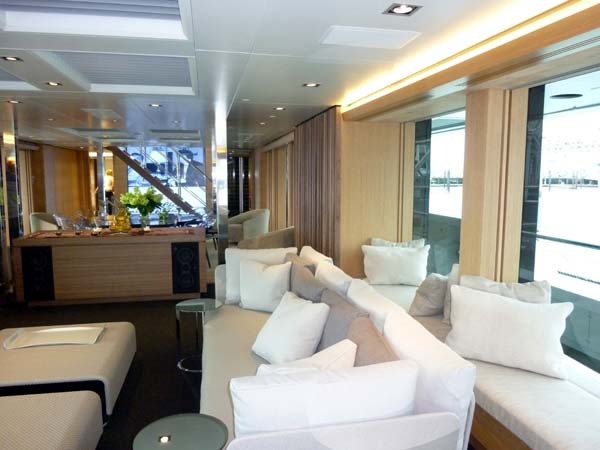 The foredeck on this world cruising yacht is huge, it creates a great expanse for lounging and relaxing and hides the huge garage that holds a custom built tender that easily carries 18 people. 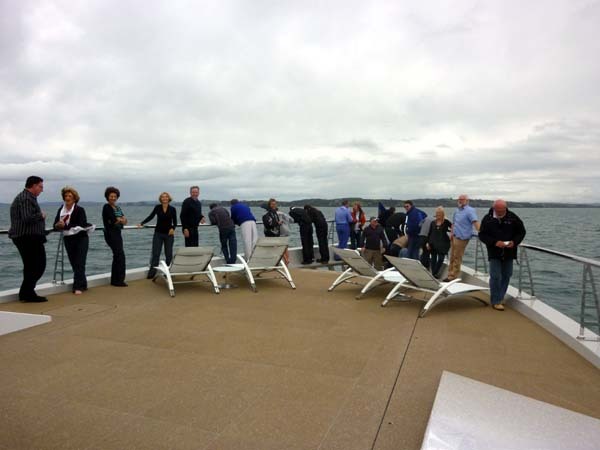 We tested it by ferrying a group of guest from the boat to Waiheke Island in the Hauraki Gulf. At one point during the trial we had a large pod of dolphins come along the bow which resulted in having over 20 people arranged around the bow rails and it barley made a dent in the space. The huge multi propose garage is a wonderful space. The innovative feature here is having the crane mounted on the under side of the large raising hatch which leaves the foredeck clear. The usefulness of the garage is wonderful, even with the tender in place it has tons of storage shelves and holds two large chest freezers. When the tender is in the water (which will be a great deal of the time considering the integrated towing winch fitted into a stern locker) the space coverts in to a huge play room for kids and adults a like. There is a table tennis set up, a large screen TV for Wii and other games and workout routines; just plain tons of room on a rainy or sunny day to do anything. The fold out beaches have been seen before, but the number and use of them is unique. 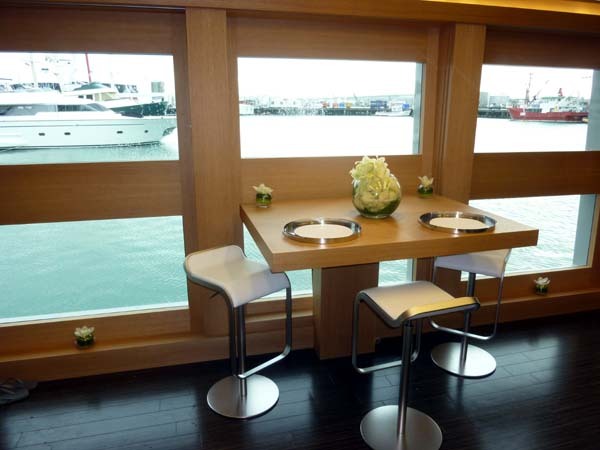 The two that are positioned at port and starboard on either side of the dining saloon when opened create an uninterrupted vista of the water and give you the opportunity to sit and have cocktails or breakfast while sitting suspended out over the water. The two aft beaches off the sides of the stern create a wonderful swimming and sunning area, easy tender access, and a wonderful spot to enjoy a few hours reading a book 1 foot from the water. Yes you can read and drink and eat and... on the huge flybridge with its BBQs, bar, dinning table, Jacuzzi and so on but to have the space so close to the ocean, it is very nice. If you want to be up high I can recommend the crows nest which can easily sit 8 persons or two in complete privacy with a stunning view of all that is around you. The interior has wonderful features the best of which is all of the extra large windows which on every level and all guest areas connects the guests and the interior with the outside world. There is nowhere on the boat with out a view. 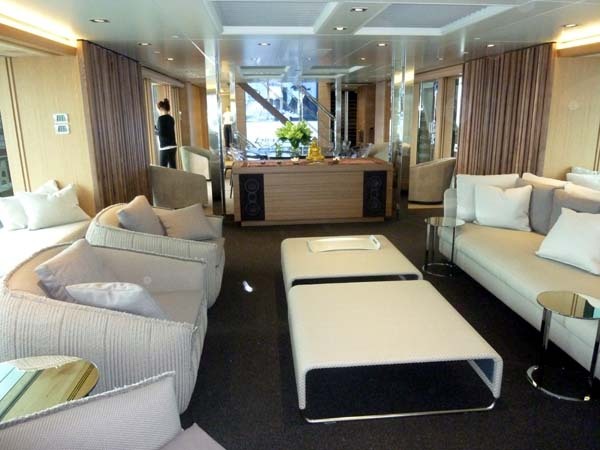 The owner's cabin, located behind the wheelhouse has the best visibility of any stateroom I have ever seen on any yacht and of course has its own aft deck. 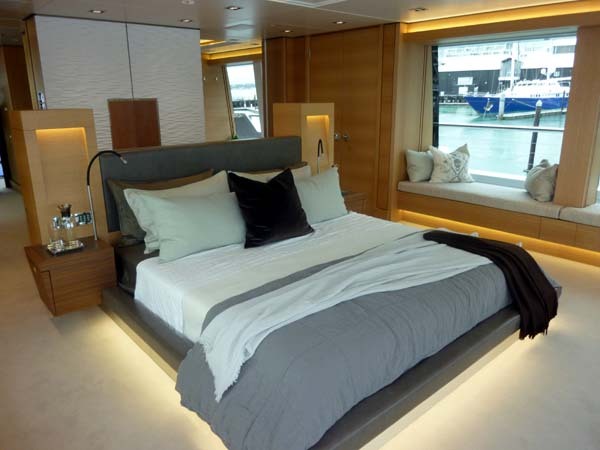 A three level stair way with sky light separates the forward zones on the boat to the aft and creates a nice sunny reading area between the master stateroom and the pilothouse. 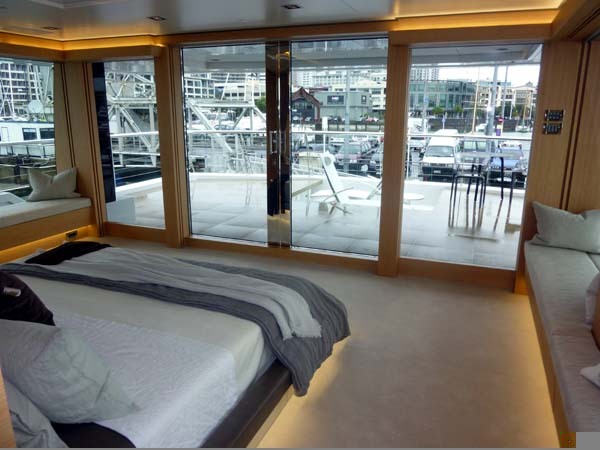 The lower guest can convert from two VIP's to four guests, a feature I always like on large, long range cruising vessels. Big Fish has a contemporary design - huge floor to ceiling windows, "bringing the outside in". If asked what my favorite area of the boat is, I can say without hesitation the galley and guest side table. The galley is full beam and incorporates a small table set against four huge windows. When seated at it you not only feel a part of the superb culinary actives that are constantly on going. You also have great views from the both port and starboard side sets of windows. 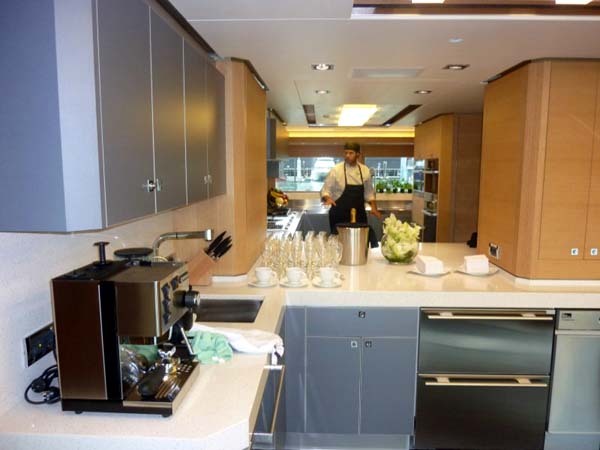 From an operational view the galley is also exceptional. There is great cooking space, 6 burner cook top with built in wok, fridge and freezers located close to the chef and stewardess, separate serving and stewardess zone with its own fridge, easily cleaned surfaces and floors and ample plating and storage. 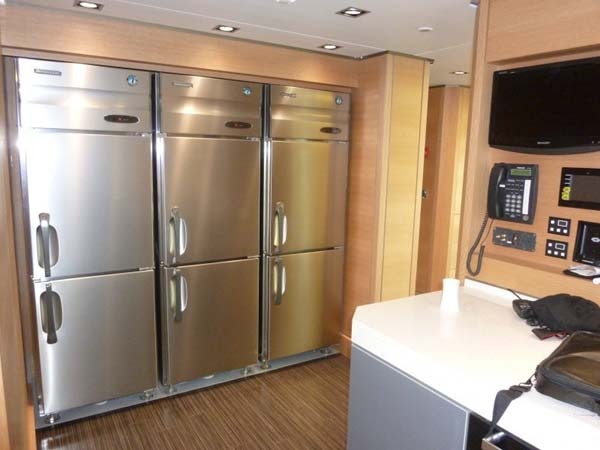 Beside the fridge and freezers located in the galley there is a huge fridge / freezer / cold room with has a bank of individual freezers. When I spoke to David Darwent about this idea verses a "walk in" his thinking behind this was very interesting, with a walk in if you have a failer you can loose all of your cold storage goods. If you have a problem with one of the 8 units they have you should be able to transfer to the others, also there is more useful space. The commercial units they are using have all of the compressors at the top so they can be easily serviced without worrying about replacing the chest section. They put a over sized AC unit in this room which brings it down a level that is consistent with vegetable storage, plus there is a wall of pantry shelving. After seeing it in action I think it is a better idea over all. Ok, let�s get to some of the other important parts. Bridge, large, very well equipped well laid out and again great visibility. There is a large settee with tables (one complaint is I think the seats in the settee are a bit short on depth), good paper chart space, even if they have two redundant high end electronic systems, large vertical windows ( I know you keep reading "large windows" but they are the single most outstanding feature throughout all sections of the vessel) and in general a good long range explorer yacht feel to it. The two wing stations are well placed with great side views of the boat. There is a radio room / captain's office / AV room behind the wheelhouse with a sliding panel that can open it to the general area. Crew quarters are quite good, the location of the owner's cabin behind the bridge made it necessary to locate the captain down one level but right off the bridge stairs, so quite acceptable. 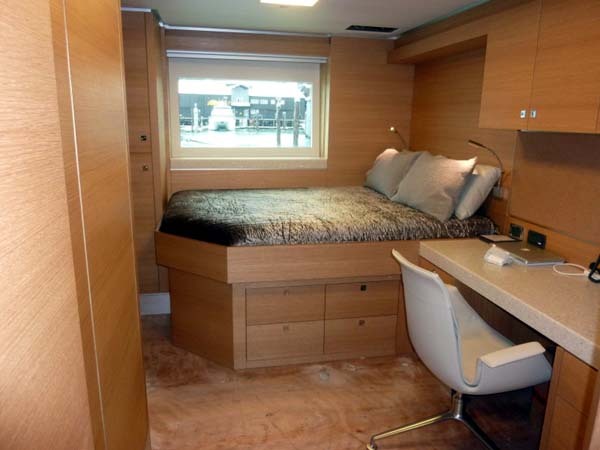 The cabin is large with a full double bed and over all very comfortable. I checked it out under way and I must say I would be very happy living there. All of the lower crew cabins are also quite good as is the crew mess which has all of the usual gear found on this size of vessel. There is a good engineers cabin located aft of the engine room off the lazarrete / toy room. The engine room is good, I cannot say it is spacious but it is well laid out and well executed. The equipment is of the highest standards and from a service side, you can get to things. I was helping out with a few things so I can tell you can get in and out of the important bilge areas like were the shaft seals are and around the engines. There is a separate control room that houses the electrical panel and has a desk for the engineer. 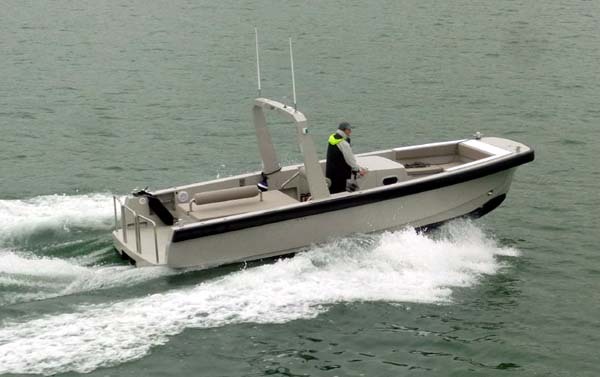 In general they did a great job of creating a very good looking vessel that has one of the lowest up keep factors I have seen, no teak at all, great stainless steel work. They have it down to even making sure the cushion covers are easily to get on and off and there are places put the cushions on long trips, something that is often missed. 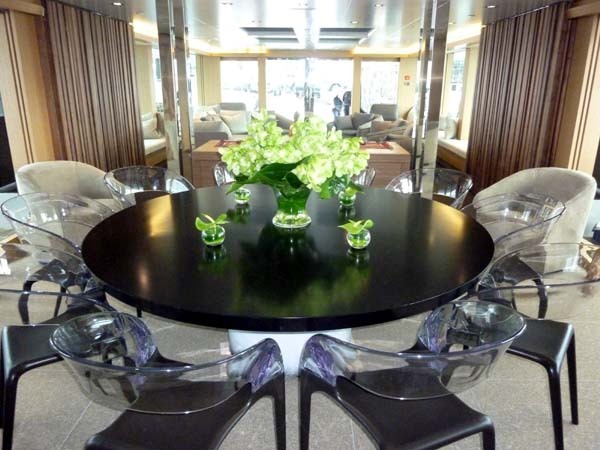 Over all I can say that I can recommend this Explorer Yacht for extended world cruising with out hesitation, she has the hull, the equipment, the storage and gear to get the job done and in a spectacular style. She is going to be easily to maintain, green to operate and will keep the guest and crew safe and comfortable. I could go on and on about other features so give me a call or drop me an email if you would like to know more about her. She is available for charter and after spending over a week around the crew I can assure you, you will not find better crew on any yacht in the world today and I do not say that lightly. Please do not get me started on the FOOD!